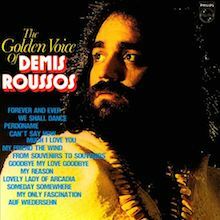 Demis Roussos became a household name in the UK and Europe with his easy-listening brand of romantic Europop music. Known as “the pop Pavarotti” because of his high, pseudo-operatic singing style, Roussos enjoyed a run of evergreen UK pop hits in the 1970s including ‘Happy To Be On An Island In The Sun’, ‘Forever And Ever’ and ‘When Forever Has Gone’. With his Mediterranean background and cosmopolitan appeal, Roussos was a charismatic entertainer who lived up to his nickname “The Phenomenon”. His international following extended well beyond the usual Anglo-American pop axis and during a prolific career stretching from 1971 until his death in 2015, he sold more than 60 million albums singing in English, French, Spanish, German, Greek, Portuguese and Arabic - all languages in which he was said to be fluent. Born on 15 June, 1946 in Alexandria, Egypt, Artemios Ventouris-Roussos was brought up a committed Christian in the heart of a Muslim community by his Greek-Egyptian parents. Always known as Demis, he studied music theory from a young age, learned to play guitar and trumpet, and became a featured singer in the choir of the local Greek Byzantine Church. He began his career in popular music after his family moved to Athens, Greece, where in 1967 he formed the progressive rock group Aphrodite’s Child in which he sang and played bass together with keyboard player Vangelis Papathanassiou and drummer Loukas Sideras. Having relocated to Paris, France, Aphrodite’s Child released their first single in 1968, a rocked-up arrangement of Pachelbel’s ‘Canon In D Major’ entitled ‘Rain And Tears’. The song became a million-selling hit across Europe and reached No.29 in the UK, providing a springboard for the band’s first album End Of The World (1968) and the follow-up, recorded in London, It’s Five O’Clock (1969). The band’s third album 666, “a musical adaptation of the Book Of Revelation” was a double-disc, prog-rock epic incorporating everything from free-form jazz and musique concrète to Middle Eastern and Raga influences. It was released in 1972, way ahead of its time musically, but two years after the band itself had actually split up. 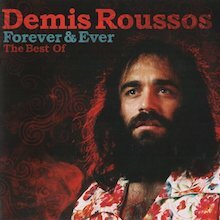 Be that as it may, it was his second album which proved what Roussos was truly capable of. Forever And Ever (1973) topped the charts in Germany, Norway and the Netherlands and reached No.2 in Austria. Released as a single, the album’s title track also became a big hit in many countries, although neither the album nor the single were successful in the UK – straight away. Even so, this one breakthrough hit in the UK up to this point was in stark contrast to the numerous hits he had already enjoyed all over Europe including ‘Goodbye, My Love, Goodbye’ (No.1 in Germany and Switzerland), ‘My Friend The Wind’ (No.1 in Belgium and the Netherlands) and ‘Someday, Somewhere’ (No.1 in Belgium), among many others. This peculiar disparity caught the attention of the UK TV producer John King who made a documentary called The Roussos Phenomenon which aired on the BBC in June 1976. An EP with the same title, featuring ‘Forever And Ever’ as the lead track, was released to coincide with the documentary, and duly reached No.1 the following month – the first time an EP had topped the UK singles chart. A follow-up single, ‘When Forever Has Gone’, reached UK No.2 a few months later by which time “The Phenomenon” had well and truly made his mark. A big man in a billowing kaftan and glittering moccasins, Roussos radiated a stage presence that was little short of messianic. Striding through ankle-deep rivers of smoke, arms outstretched, his features framed by a tangle of jet-black hair and beard, he sang in a yearning voice “as light and high as a string section”, according to the NME. Although best known for his hit singles, Roussos enjoyed a UK No.4 success with Happy To Be (1976), an album which highlighted his ability to combine mainstream pop appeal with musical influences from many ethnic and geographical sources: Greek, of course, but also French, Arabic, Latin, classical music and much besides. His most celebrated UK album, and the one that most comprehensively drew together the highlights of his incredible career was the 2002 compilation Forever And Ever – The Definitive Collection. Along with all the songs that Roussos was best known for, this set also included the Aphrodite’s Child hits ‘Rain And Tears’, ‘I Want To Live’ and ‘It’s Five O’Clock’. A larger-than-life character in all departments, Roussos went on a crash diet at the start of the 1980s, which enabled him to shed 50 kg (about one-third of his body weight) in less than a year. He documented this heroic battle of the bulge and other issues linked to depression with good humour and remarkable candour in an autobiographical book A Question Of Weight (1982), co-written with the photographer Veronique Skawinski, which became a best-seller. At the same time he updated his image and auctioned off the kaftans for charity. In June 1985, Roussos and his third wife, Pamela Smith, were among the 145 passengers on TWA Flight 847 from Athens to Rome when it was hijacked by Hezbollah militiamen. The couple were released unharmed with several other Greek passengers after five days. Other hostages were not so fortunate. Some remained on the plane for 17 days and a 23-year-old American was murdered, his body dumped on the tarmac. Roussos, who since childhood had been a devout worshipper in the Greek Byzantine Church, took his safe delivery from such mortal danger as a signal that he should continue to promote peace and tolerance through his music. He toured until the release of his final album, Demis, in 2009. He died on 25 January, 2015 at the age of 68. 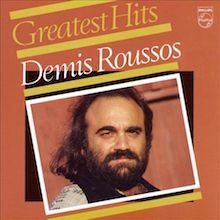 After collaborating with pal and fellow Greek star Vangelis, singer Demis Roussos continued on in the pop mode he initially plied when covering the days' hits during the mid-'60s. His profile quickly soared with several popular sides that were released in the first half of the '70s. Polygram has compiled the highlights on this 12-track roundup, making sure to include such well-known chart-toppers as "Goodbye My Love Goodbye" and "My Reason." And while Roussos never broke into the American market, his Greek-tinged form of international pop found many receptive fans throughout the Mediterranean and in Europe. His full-blown take on contemporary pop begs some comparisons to such stateside belters as Neil Diamond. Beyond the requisite string charts and choral backing, though, Roussos' music finds some unusually attractive terrain thanks to a bit of synthesizer noodling and the occasional rock rhythm. A perfect introduction to the singer when he was in his first flush of fame as an MOR celebrity, all sung in English with the requisite amount of heart-on-sleeve pathos. 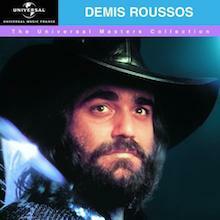 The Universal Master Collection is a 1999 greatest hits compilation by the Greek-Egyptian vocalist Demis Roussos. Its 17 tracks contains the original versions of his best known songs of the period. That said, it should be noted that the version of "Senora (I Need yYou)" is not the single Spanish language version, but an English rendition recorded later. In addition, this set should not be confused with the 2006 album of the same name. While the pair have songs in common, there are key content differences.